Nestled in an oasis-like compound of late 1940s heritage houses in Pasay is the Manila outpost of Cebu’s popular Henry Hotel. The five post-war “Liberation style” houses have been adapted and transformed by renowned Filipino furniture and interior designer Eric Paras into this 34-room boutique hotel. Every detail has been executed to keep with the vintage theme, transporting guests back to another era. The tiles, the antiques, and the garden complete with post-war-appropriate greenery all make it perhaps the most exciting hotel in Manila at the moment. 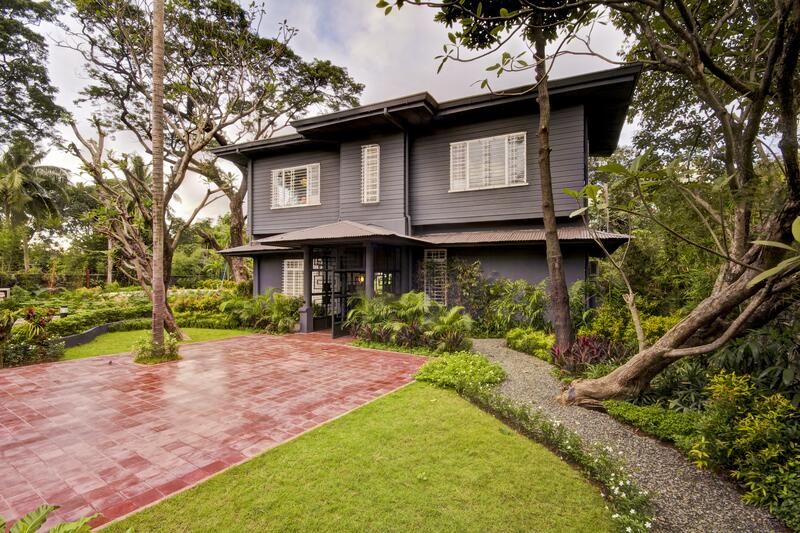 The same compound of post-war heritage houses is home to Avellana Gallery, designer Jojie Lloren’s atelier, and Artelano 11, a major design destination. In the space, furniture designer and interior designer Eric Paras not only showcases Industria, his collaborative line with Jude Tiotuico, but he has also carefully curated a stellar collection of mid-century pieces, vintage tabletop items and dishware, and standout work from other local designers. Located in the central business district of Makati on Nicanor Garcia St., which has become Manila’s mini design district, the LRI building is one-stop shopping for local furniture and design. Highlights include established brands such as Triboa Bay and the recently rebranded Philux, Heima’s bright and whimsical designs, custom-made and restored furniture from Oz Gallery, and industrial designer Gabby Lichauco’s recently launched Open House (pictured). Tucked away in a corner of Makati, W-17 is an elegant warehouse space showcasing luxe home wares from the Philippines and beyond. Catch Carabao (Philippine water buffalo) horn salad servers, elegant wood serving bowls trimmed in gold, locally crafted dinner ware, and antique Chinese furniture, along with rugs from New York-based Filipino designer Inigo Elizalde. One of the leading local contemporary art galleries in Manila, Silverlens—which also has a presence in Singapore—is owned by Isa Lorenzo and Rachel Rillo, both photographers. They represent much of the exploding Manila art scene, including Patricia Perez Eustaquio, Gary Ross Pastrana, Maria Taniguchi, Pio Abad, and Renato Orara, the only Philippine artist actively collected by the Museum of Modern Art. The 40,000-square-meter Makati showroom of Cebu-based, internationally renowned furniture designer Kenneth Cobonpue does not disappoint. Known for promoting Filipino craftsmanship by incorporating natural materials into his award-winning designs, his Chiquita stool is crafted from rattan poles which together create a surprisingly comfortable cushion. Envisioned in the 1950s by Philippine abstract painter Fernando Zobel as a showcase for local and international talent, the Ayala Museum is located in the Makati CBD, in a new building designed by Leandro Y. Locsin Jr. The museum is connected to the upscale, semi-outdoors Greenbelt shopping mall. Don’t miss the permanent gold exhibit. An example of adaptive reuse in a city where historic preservation has not always been priority, the Blackbird restaurant is housed in the former Neilson Tower, which was one of Asia’s first international commercial airports. The only pre-World War II structure in Makati, this Art Deco gem has been beautifully converted into an aviation-themed restaurant by chef Colin Mackay, a Scottish expat chef with three other top Manila restaurants under his belt. Intramuros, the walled city that was the seat of the government during the Spanish colonial period, is the oldest historical attraction in a city that was firebombed during World War II. Bambikes handcrafts bamboo bicycles with fair trade labor and green building practices. The bikes are the perfect way to explore this part of the city. While not a traditional design destination, Manila is a city that wears many hats, and lately design hot spot is one of them. Often dismissed as another over-crowded and polluted Southeast Asian capital city, or merely a stopover en route to one of the Philippine’s many island resort destinations, Manila has recently been coming into its own. The art scene is vibrant, and furniture design—which has always been the Philippines' forte—is being taken to the next level by some exceptional local talent. With ample foreign investment, and plenty of creatives developing the city in exciting new directions, Manila is quickly becoming a destination in its own right.